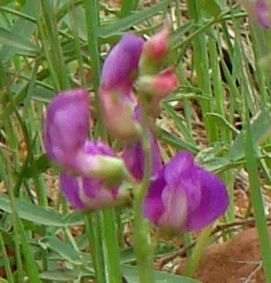 Synonyms: Lathyrus zionis. Another common name for this taxon is bush pea. 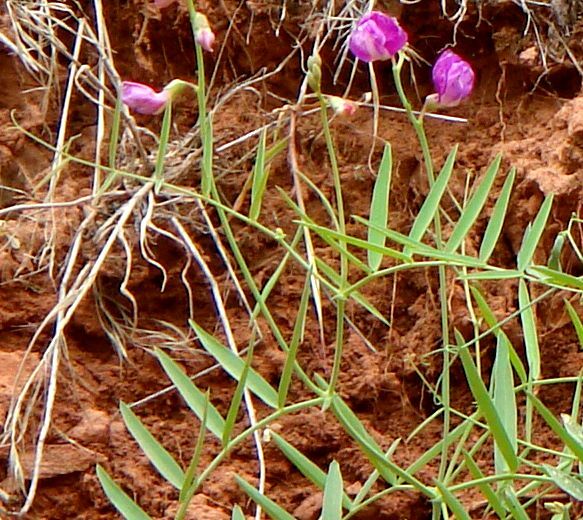 Other common names for the species Lathyrus brachycalyx are Bonneville pea; Bonneville peavine; Bonneville vetchling; and Rydberg's peavine. Wendy C. Hodgson, an expert on the plants of the Grand Canyon, kindly confirmed this determination, since I was worried about two characteristics of these plants - the very narrow leaf width and what appears to be a non-cordate apical banner margin. 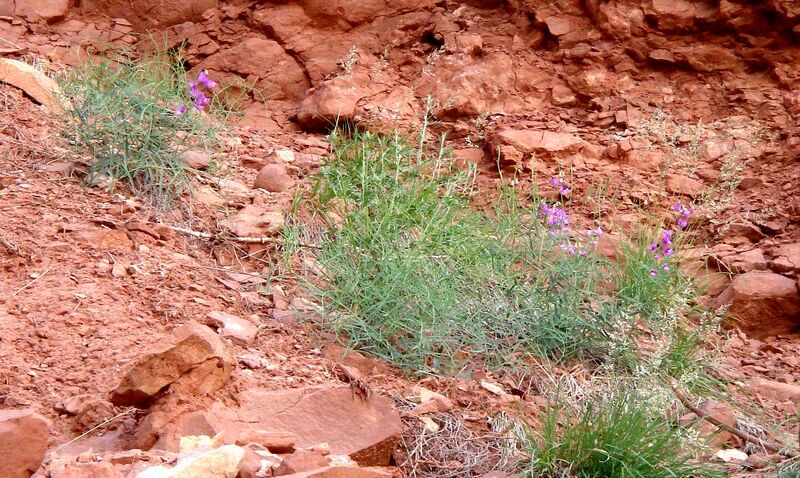 Also, Wendy said that the plants shown in the photographs below are representative of these plants in the Grand Canyon. All plants seen by myself on this trail in May 2008 appeared to be the same species, and each of the three occurrences on the trail are shown in the photographs below. Even though the determination of these plants is not in doubt, there has been significant confusion as to what to call these plants. 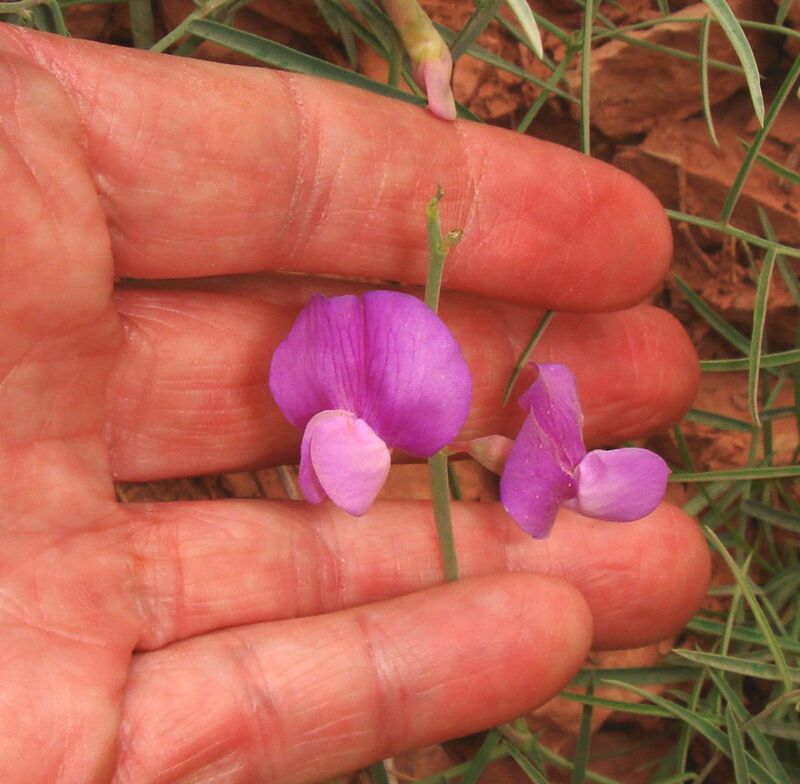 At least two popular Grand Canyon flower identification books erroneously call these plants "L. graminifolius". McDougall's 1964 Flora of the Grand Canyon, Grand Canyon Wildflowers, oddly calls these plants "L. eucosmus". See below for more information on these misdeterminations. The misdetermination of these plants as "L. graminifolius" may result from the narrow leaf width of these plants. I initially made that mistake, which I caught only after seeing a record of L. brachycalyx in a nearby voucher from Wendy Hodgson. 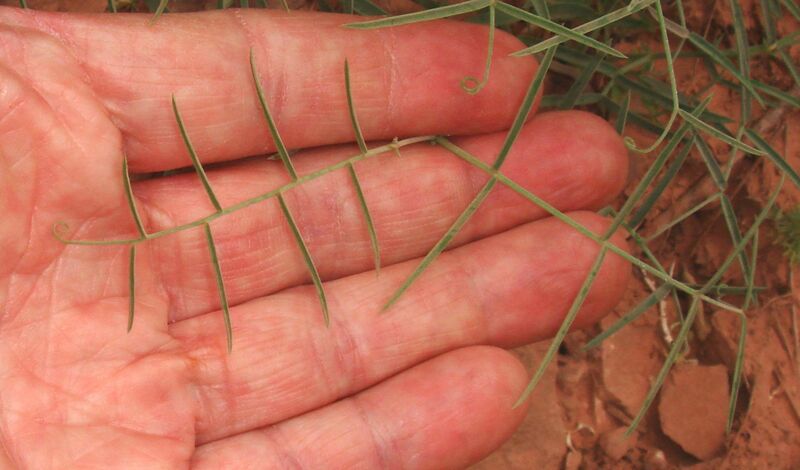 The extremely-narrow leaf width, as small as 0.5 mm, is significantly smaller than the 2 mm minimum leaf width given in the Utah Flora for L. brachycalyx. The length to width ratio of ~25 for the narrowest leaves is more reminiscent of L. graminifolius, which has a ratio always above ten. However, the minimum leaf width of 2 mm given in the Utah Flora for the species is the same as given in the original description of L. brachycalyx, prior to the recognition of ssp. zionis. Subspecies zionis may have narrower leaves since its leaves are described as linear instead of linear-oblong or oblanceolate. (I haven't yet seen the original paper on L. zionis, so do not know what it gives for the minimum width.) Thus it is possible that the Utah Flora simply does not correctly give the minimum leaf width for ssp. zionis. Also, most plants had leaves at least as wide as 2 mm. Only a single plant in the driest location had a minimum leaf width of 0.5-1.5 mm. Here are two images from near the type locality for ssp. zionis: first image and second image for comparison to my photographs below. L. brachycalyx was defined in 1907 by Per Axel Rydberg. The type specimen was from City Creek Canyon, Utah. 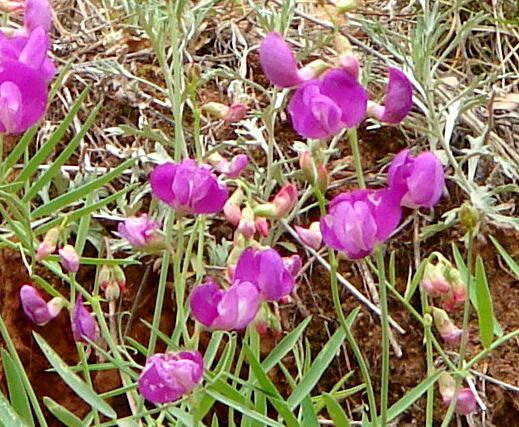 In 1951, in the Lathyrus brachycalyx treatment in the Arizona Flora by Kearney and Peebles, C. Leo Hitchcock wrote The Arizona plants may belong to another (unpublished) species. In 1952, Hitchcock published that new species, L. zionis, with the type specimen from Washington County, Utah, USA. 10 miles E of Zion National Park entrance. In 1965, Stanley Welsh reduced L. zionis to a subspecies of L. brachycalyx, and in 1978, reduced it further to a variety of L. brachycalyx. Both SEINet and USDA Plants now prefer the name L. brachycalyx ssp. zionis. The plants fit McDougall's description except for the leaflets being narrowly linear, instead of narrowly oblong to elliptic. 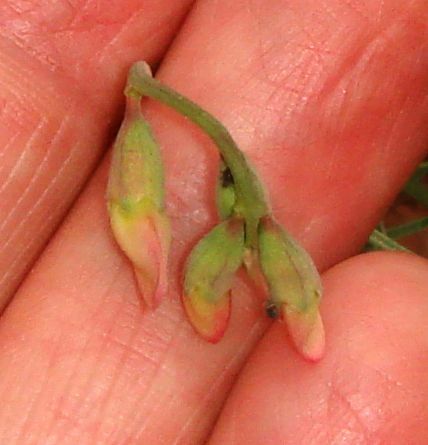 However, L. brachycalyx is not in McDougall's key or flora, so this keying does not rule out L. brachycalyx. Also, a synonym for L. eucosmus is L. brachycalyx ssp. eucosmus, and McDougall may be treating both taxa under the species name of L. eucosmus. However, if so, it is a bit unusual that McDougall would not have given L. brachycalyx as a synonym, especially since Kearney and Peebles reported L. brachycalyx from the Grand Canyon in their earlier flora. Thus these plants might also have been misidentified in McDougall. My banner appears to be shallowly cordate, if at all, fitting L. eucosmus. But the banner is very wide, and the calyx teeth are very short, fitting L. brachycalyx. The latter two characteristics are most likely more trustworthy, making the determination L. brachycalyx. The Utah Flora says banner often deeply emarginate apically, so apparently that characteristic is indeed variable. Also, apparently the notch in the banner is quite narrow, as shown in this image from near the type locality. It is possible the notch is simply mostly obscured in my pictures. Clearly, there are significant problems with a determination other than L. brachycalyx. Using the variety key in the Utah Flora, this is ssp. (or var.) zionis, being glabrous, and with the banner blade as wider or wider than long. USDA Plants places only ssp. zionis in Arizona, along with Nevada, Utah, Colorado, and New Mexico, with ssp. brachycalyx only found in Utah, Nevada and Idaho. L. brachycalyx: One from the Bright Angel Trail at 5050 feet elevation and one from Hance Creek at 3500 feet elevation, both determined by Hodgson, from Desert Botanical Garden Herbarium. One from the Bright Angel Trail determined by Christie; one from the Grandview Trail determined by Morefield, from the Deaver Herbarium at Northern Arizona University. One with a locality of just Grand Canyon from University of Arizona. Elevation range is thus 3500 to probably 7000 feet here. 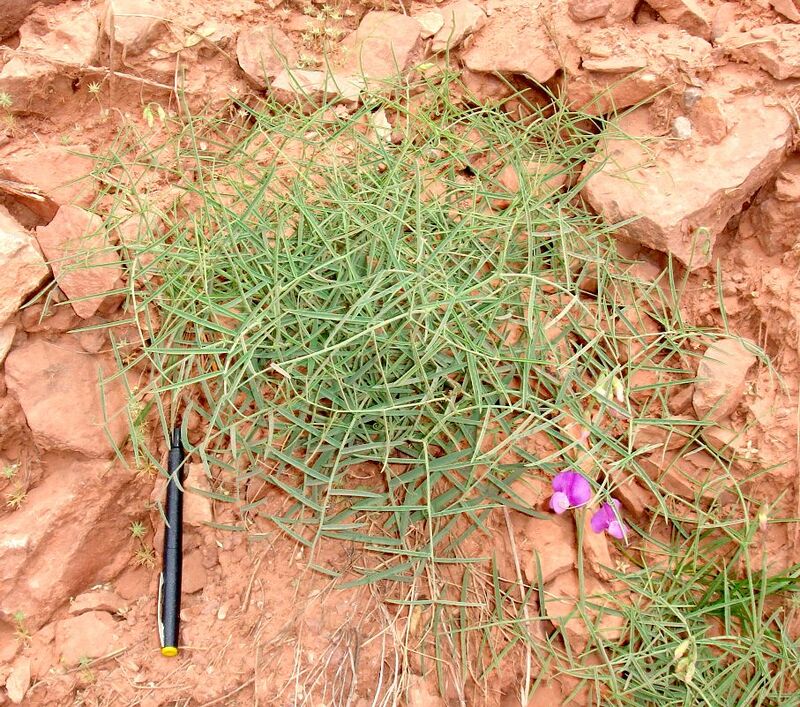 One voucher from Navajo County; Betatakin Canyon, is at an elevation of 6800 feet, and the label says exceptionally narrow leaved form, so the very narrow leaves of these plants are probably not a problem. L. eucosmus: One from Yavapai Point, determined by Brian, from the GCNP Herbarium. Two from Grand Falls, Little Colorado River, one determined by Reese; both from the Deaver Herbarium at Northern Arizona University. One with a locality of just Grand Canyon from University of Arizona. Elevation range is thus 4500 to 7000 feet here, consistent with the range of 5000 to 7000 feet in Kearney and Peebles. L. graminifolius: Three from the Bright Angel Trail; two from the Dripping Springs / Hermit Trail; and one each from the New Hance and Berry Trail, all from the GCNP Herbarium. These vouchers were determined by US National Herbarium; Kearney; Hodgson; Collom; and Brian. Elevation range is 5200 to 7000 feet from these vouchers; the 1987 Grand Canyon Flora gives 3800 to 7000 feet. 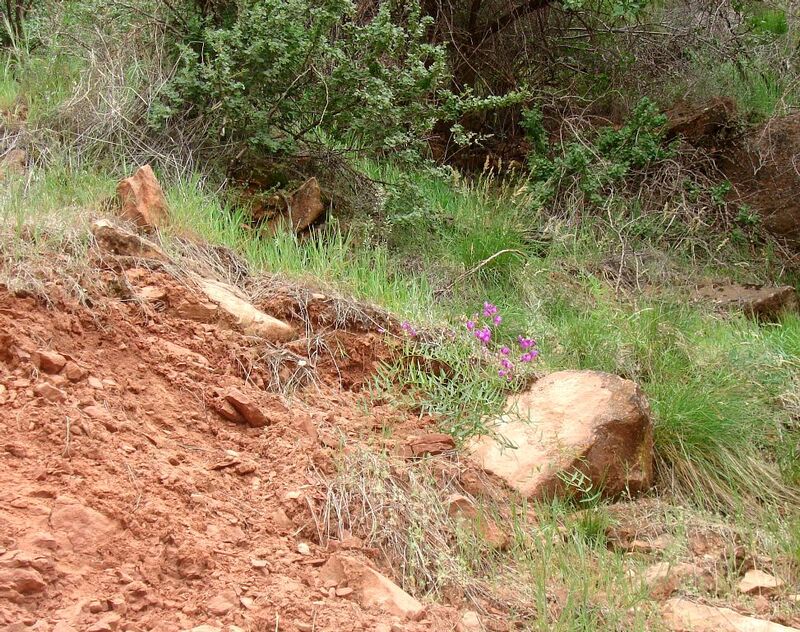 It is definitely curious that there are three vouchers of L. graminifolius from the Bright Angel Trail, and two vouchers of L. brachycalyx, from the same elevations, yet I only saw a single species on the trail in May 2008. One possible explanation is that at some of the vouchers of L. graminifolius are misdetermined. My suspicion comes because it appears that the plants on this trail have been erroneously called L. graminifolius in at least two books: Grand Canyon Wildflowers by Phillips and Richardson, and A Field Guide to the Grand Canyon by Whitney, first edition, 1982. The pictures and drawings in those books are clearly of the same plants called L. brachycalyx here, with large showy pink-purple flowers. 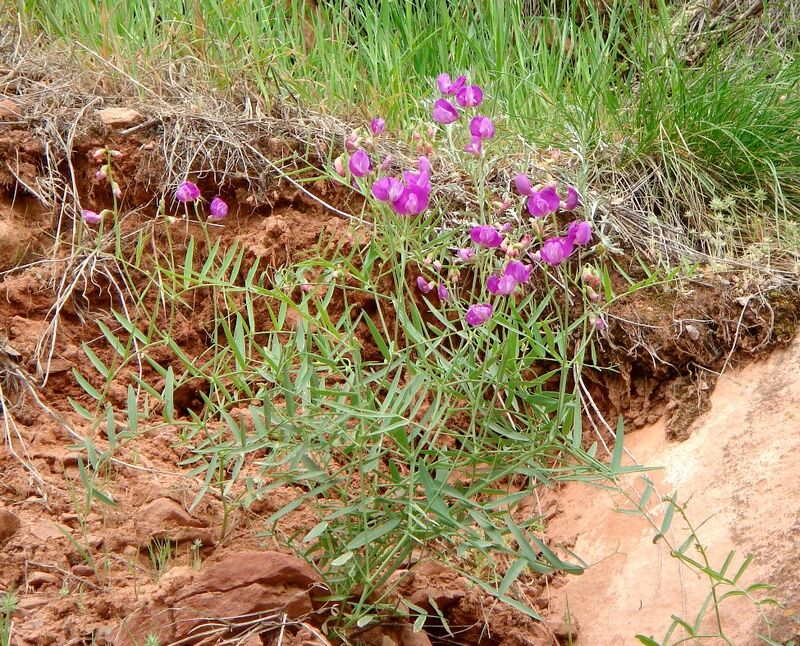 For comparison, see pictures of the lavender to purplish banner, and whitish keel, of L. graminifolius from Pinaleño Mountains in Arizona and Gila Wilderness in New Mexico. See also Images of vouchers. It is also curious that McDougall did not include any mention of L. brachycalyx in his Grand Canyon Wildflowers. It is possible that he misdetermined these plants as either L. graminifolius or L. eucosmus. Hitchcock, in Kearney and Peebles, says that L. graminifolius grows chiefly in pine forests, whereas L. brachycalyx is in the sagebrush-juniper area. 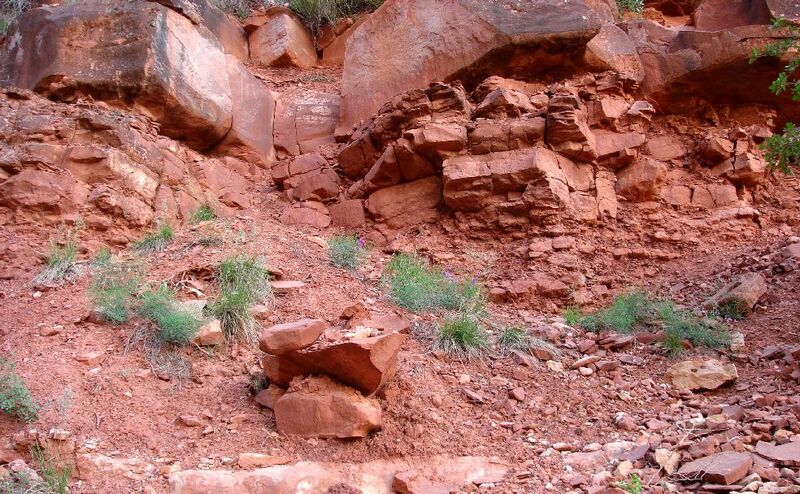 The habitat of the Bright Angel Trail is definitely closer to sagebrush-juniper than to pine forest. First occurrence on Bright Angel Trail: off-trail at mile 1.91, elevation 5518 feet (1682 m); on-trail at mile 2.91, elevation 4805 feet (1465 m). Number of plants along Trail: at least 2 plants were found in at least 1 different location on trail in May 2008; they occur in at least two additional places off-trail. From 5 May 2008, mile 1.91. These plants were off-trail on a shelf above the drainage, and could not easily be reached. These photographs were taken from considerable distance, the second using a 3X telephoto lens. From 6 May 2008, mile 2.58. These plants were just a bit off-trail in the drainage, but still could not be easily reached for close-up examination, only via telephoto lens. From 6 May 2008, mile 2.91. These plants were right beside the trail, and were the only plants not found immediately along a significant drainage. I am grateful to Wendy Hodgson for reviewing the determination of these plants, and for a stimulating discussion about the taxonomic status of them.